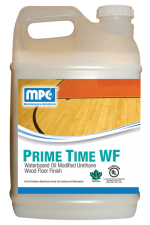 A blend of refined solvents formulated for use in cleaning and preparing wood and other hard surfaces prior to sealing and/or finishing. 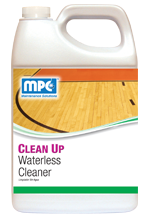 Easily removes soil, dirt, oil, black heel marks, rubber burns, chewing gum, and tar. An excellent product for tack ragging wood, and as a clean-up solvent for application tools. Designed to evaporate quickly, leaving no greasy or oily residue to damage gloss and/or prevent bonding. Not for use on resilient tile. Apply with a mop and bucket to areas of approximately 100 square feet. Immediately scrub with a scrubbing pad or steel wool. Pick up with a wet vacuum or mop. Rinse floor thoroughly with fresh product and allow one hour dry time prior to coating. Apply to clean cotton towels, making sure not to over-wet. Tack in usual manner. Apply to clean cotton cloth. Rub soiled area until clean. Apply directly to larger areas of soils or rubber burns and allow to soak for several minutes before wiping clean. Spray product directly from container and wipe dry. Immerse parts to be cleaned in solution. Wipe or air dry. In federally inspected meat and poultry plants, equipment must be washed with an effective cleaner and rinsed with potable water. Weight per Gallon 6.87 lbs./gal.